Although their high antioxidant levels and low sugar content make aroniaberries a bit tart to enjoy on their own, they are a great addition to a variety of recipes. One of the most popular ways to use aroniaberries is in a smoothie—a great and healthy way to start your day! They can also be put on cold or hot cereal, or added to pancake batter. And they make a great substitute in other berry recipes, from cranberry sauce to blueberry muffins. The following is a collection of some of our favorite recipes. 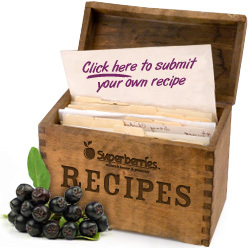 Visit this section often, as we frequently add new recipes submitted by Superberries users. You now can buy Frozen Aronia Berries year around online at Superberries.com. Freshly Frozen Aronia Berries and Aroniaberry Concentrate add a delicious berry flavor when added to your recipes. The most popular aronia recipe category is the aronia smoothies recipes including: Aroniaberry/Orange Juice Smoothie, Aronia Coconut Smoothie, Aronia Fruit Smoothie, and Aronia Pom Smoothie.